immigration | Notes from the U.K. Sorry, no jokes today. I just read a post by a Ugandan seeking asylum in Britain. She’s being held the Yarl’s Wood detention center and is on a hunger strike. Let it serve as a quick introduction to the craziness and cruelty of the current British approach to immigration. Her post isn’t an easy fit here, but the world isn’t all jokes, and as a fellow immigrant, although a far luckier one, I can’t just walk past without calling attention to it. I found the post in Phil Davis’s A Darkened Room. He works with asylum seekers and writes well and knowledgeably about their struggles. Ethnicity in Britain and the U.S. I had an appointment at a clinic recently, and since it was my first time there, the receptionist asked my ethnicity. Maybe they always ask. Maybe they were taking a survey for a few sample days. I have no idea, but I do understand why an organization might want to gather that information, and it seems like a simple question, except it isn’t. Even in the U.S., where I fit the categories better, it’s not a simple question. Before I go on, I should warn you: I haven’t managed to be funny about this, but I think the topic’s worth some thought. If you want to bail out, this is as good a time as any. I’ll stick an irrelevant photo in and you can slip away. No one will notice. Irrelevant photo: It looks like last week’s semi-relevant photo, but the text is different. I only do this to see if you’re paying attention. The kids were furious. The ones who were mixed didn’t want to deny any part of their heritage. The kids who weren’t were furious on their friends’ behalf. It’s a system I grew up taking for granted. When I was a kid, as far as I knew forms had always worked that way. I didn’t stop to ask if it made sense. For one thing, I fit the categories well enough: If the choices were Black, White, Asian, Other, I picked White. If one of the categories was Jewish, I picked Jewish. I never thought I should pick Other if Jewish wasn’t offered as a category. The world around me said I was white, so who was I to say different? When the form got more specific about my category of white, I was dutifully specific. I was like a cat: I poured myself into whatever shape was given. If the shape was a shoebox, I became rectangular and filled the shoebox. If it was a casserole dish, I became round. You do know about the scientist who won an Ig Noble Prize for demonstrating that a cat is both a liquid and a solid, right? That’s the kind of cat I was. Fast forward a few decades, well past the time when my friend was teaching junior high. I made a call to the wonderful information line the Hennepin County Library used to run, checking on something that had come up in a manuscript I was editing. You could ask anything and a librarian would do his or her damnedest to find an answer. At the end of the call, the librarian explained that they were doing a survey to find out who their callers were and would I mind answering a few quick questions? I’d have answered anything. I loved that service. I’d lived in Minnesota for more than thirty years by then. I no longer thought that Jewish fit without question or notice into white. The Midwest had given me a strong sense of my otherness. I hadn’t expected to say that—I never had before—but my brain outruns its filters sometimes. The librarian stammered a bit, then pulled himself together to ask what I meant. He laughed, fortunately. I don’t know what he wrote down and I didn’t ask. I wasn’t just being difficult. Both history and recent events tell me not to take anything for granted. Where do I fit in this? White British? Legally, I am British—I’m a citizen, and I’m still provisionally white—but what does white British mean when you talk about ethnicity, not citizenship? British isn’t my native culture, and ethnicity is about culture, although people in color-coded societies tend to think it’s about skin color. So no, British probably isn’t what I should check. (As an aside, have you ever seen the phrase “ethnic hair” running around loose? Guess whose hair comes up when you google it. It’s hair whose cultural background leads it to be very, very curly. Hair typical of the dominant group, whether you count that numerically, politically, or economically, is just hair. Hair from the, or a, non-dominant group is ethnic. In case I need to prove how much I don’t understand British culture, I’m both fascinated and baffled to find that within the white British group, they list the four nations that make up the United Kingdom but also offer the option of writing just plain old British, as in still British but not Scottish, Welsh, Irish or English. What are you saying when you pick that? That you’ve moved around a lot? That you’re of mixed heritage and don’t want to deny any part of yourself? That the country’s four component nations mean less to you than the country itself? To be fair, I’ve written about this before and a few people wrote in to say they considered themselves British, not English, Welsh, Scottish, or Northern Irish. And I appreciate their comments, but I can’t claim to understand them fully. 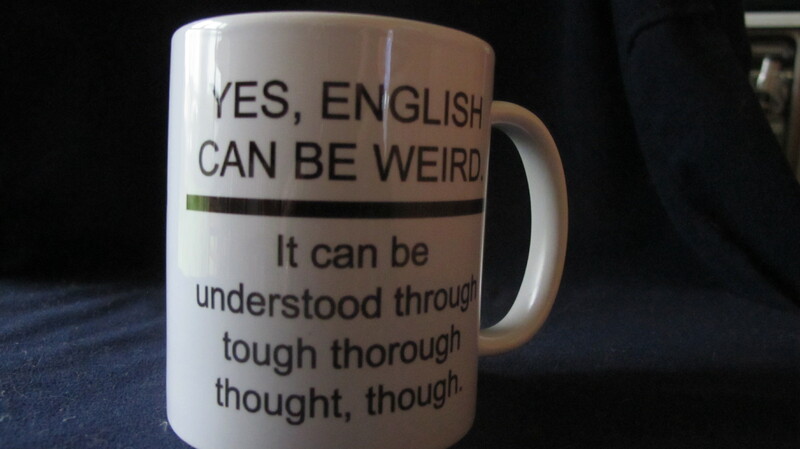 It’s much easier to understand a Cornish friend who says he’s not English. But back to the form: If you’re black, you can choose Black British, but if you consider yourself Black Welsh, for example, you have to write that in yourself and you’ll end up in some tiny subgroup that doesn’t get counted because it’s not on the form and too few people joined it. The silent assumption seems to be that Welshness (or Englishness, or etc.) is white. Is it? I don’t know. I suspect it’s not that simple, but hey, I’m a foreigner here. The gift I bring is that I can ask uncomfortable questions, not that I can answer them. But back to me: What’s my ethnicity in Britain? American? Is American an ethnicity? If you’re inside the United States, it’s the default setting. It probably is an ethnicity but it’s invisible–at least to its members. Is Norwegian an ethnicity? If you’re outside Norway, yes. If you’re inside? well, again, it’s invisible. I grew up in an age that accepted many of the absurdities of racism without challenge. I accepted white as an unchanging category and had no idea I was doing that. Then somewhere along the line I read that it was an American creation, something that developed in response to slavery. In Europe, I read, people who in the U.S. would be considered white didn’t think of themselves as whites. They thought of themselves as British, or German, or Polish. Nation, language, and culture trumped skin color as the defining factor. And it did seem true that immigrant groups who in the U.S. were considered white initially felt little in common with other ethnic groups who were also considered white. They felt themselves to be part of their old categories—Irish, Jewish, Italian, Greek, whatever. This unsettled what I’d thought were the world’s fixed categories and left me thinking that you become a group in response to some other group—or in the case of the U.S., in order to exclude another group. So is American an ethnicity in Britain? Instinct says no, mostly because there aren’t enough to us to form a group. And because I’m not in the habit of thinking of us that way. Jewish, then? Well, yes, that does seem like an ethnicity and when it comes up it makes me very distinct but it stands out much less in my everyday life than my Americanness. So what did I tell the nice person behind the desk? “We’ll make something out of that,” she said. I have no idea what she decided I was. A personal note, since said I opened by saying I was at a clinic and since a while back I mentioned, without explaining it, that I was going through a rough patch: This fall, I discovered that I had breast cancer. I was incredibly lucky. The tumor itself was tiny but it was associated with a cyst big enough for me to have found it. I’ve had surgery and can now dance off into the rest of my life without needing radiation or any other further treatment. The NHS—Britain’s National Health Service—has been incredible. And (Americans, take note) the treatment was free. Apologies if I went all mysterious on you about it. It’s not something—obviously, since I’m mentioning it now—that I feel particularly private about. But this isn’t a support group (and how do you feel about that? ), and this isn’t a me-and-my-life blog. While everything was still up for grabs, it didn’t feel right to get into it online. And finally, a quick thought related to the post’s topic, not to breast cancer: A friend commented recently that I go on a lot about being a Jewish atheist, and I’ve been thinking about that ever since. In part, it may be because being an immigrant has left me thinking quite a bit about identity (see above, because I don’t want to start that mess all over again). It may also be partly because the British don’t find atheism shocking. Americans–and yes, I’m generalizing–do, and until I moved to Britain I wasn’t in the habit of talking about it casually. It was too charged. Mentioning it meant I either risked shocking someone (I’m willing to do that when I have no choice, but I don’t generally enjoy it) or getting into more of a conversation about it than I wanted to. I may come back to that at some point. I may even manage to be funny about it, as I haven’t managed to be here, but I can’t promise. A few weeks ago, I had one of those moments that remind me how immigrantish I am, even after eleven years in Britain. I mention it because so many anti-immigrant complaints come down to this: Immigrants too immigrantish. Why can’t they just be like us? Mind you, I don’t think everybody staying in the cultural boxes they were born to is a recipe for universal happiness, let alone world peace. But those immigrantish moment do remind me why people who live in cultures they didn’t grow up in don’t instantly blend into the new one. What happened was this: My singing buddy, G., and I were working on a song and decided we’d sing the chorus twice because it’s short and In the kind of music we sing joining in on the chorus is eleven tenths of the fun. So, we figured, let’s give ‘em more chorus. Then managed to forgot how many times we’d sung it. So, clever me, I thought I’d keep count on my fingers: index finger, one time through; index and middle finger, twice through and time to move on. By the time I realized what I’d done, I was laughing too hard to sing. If you’re not British, you have no idea what I’m talking about. Holding up two fingers (if the palm’s facing the owner of the fingers) is right up there with flipping someone the bird. Or is flipping the bird only understood in the U.S.? It’s right up there with holding your middle finger in the air, all by its lonesome. If I’m still basing myself too heavily in the insults and explanations of my native culture, let’s try this: It’s a serious insult. 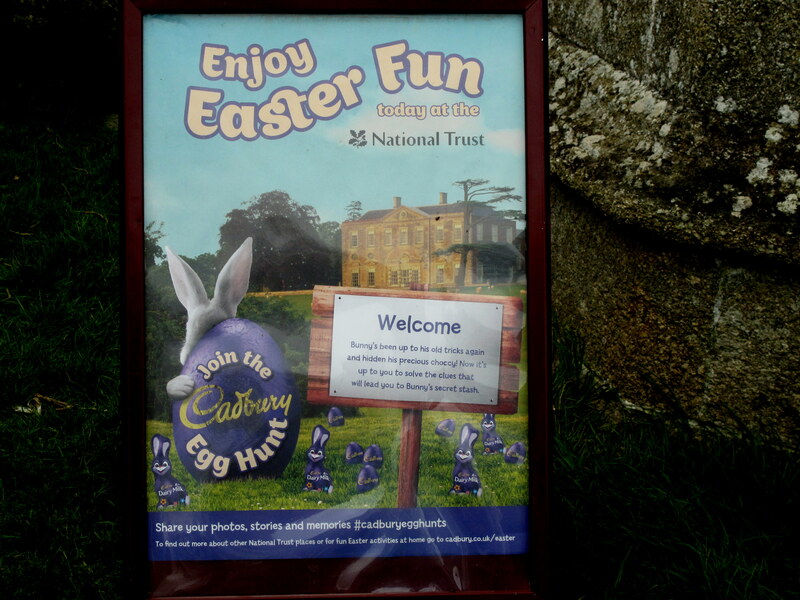 A photo that would’ve been relevant to last week’s post: This is the National Trust/Cadbury poster promoting their egg hunts. You’ll notice that for all the complaints about Easter being airbrushed out, the first line that the eye picks up uses the word. I’ve lived in the U.K. long enough to know that, but my nerves and muscles haven’t. They’re stubbornly American. On the instinctive level, which is where they do their work, two fingers are just two fingers. If I want to order two teas and there’s some confusion about how many I asked for? May all the gods I don’t believe in protect me, those are the fingers I’d be most likely to hold up. It’s long-distance communication. Communication that carries over the noise of a cafe. It’s also a good way to very seriously insult someone. But that’s the thing about nerves and muscles. They work faster than the brain. Faster than the thought, You’re in a country where you don’t count on your fingers that way. So that’s one reason immigrants are so stubbornly immigrantish: Unless you move to a new country when you’re young, some parts of you just don’t change. Even if you set out to adapt your habits, one by one by one, as I haven’t, there’s always something left. How do people count on their fingers here? I have no idea. In some countries, I’ve been told, you start with the thumb. Two coffees? That’s the thumb and index finger. Hold up the thumb and middle finger and you’re likely to end up with three coffees. But in Britain? I can’t remember anyone waving fingers around to let someone else know how many teas or coffees or beers they want. For all I know, it’s an un-British way to communicate. D. swears that if a doctor asks, “How many fingers am I holding up?” it will always be three. I don’t remember the reason it won’t be one, but she says they’ll be afraid to hold up two and are too lazy to hold up four or five. Why is sticking two fingers up an insult? No one seems to know. 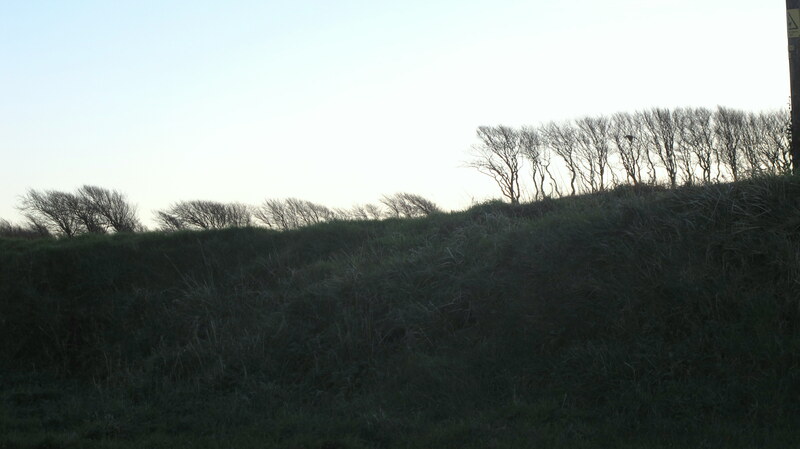 The usual story has to do with the Battle of Agincourt, which was won by English archers and the longbow. The English are still sticking two fingers in the air to show the French they haven’t lost the ones that matter to an archer. Unfortunately, every place I found it explained that way also said it probably wasn’t true. But if you hear about me getting into a brawl somewhere, it’ll be because it was noisy and I was trying to ask for two of something. A vigilante has been roving night-time Bristol for thirteen years now, correcting the apostrophes in signs. Yes, friends, someone has dedicated his life to that, and the BBC interviewed him early in April. Is what he’s doing illegal? “It’s more of a crime to have the apostrophes wrong in the first place,” he said. And although proofing your own writing is a losing battle (I’ll quote on that anytime I have to explain a typo on the blog), I’ve proofed that quote three times to make sure the apostrophe was in the right spot. The interview led a newspaper columnist, Catherine Bennett, to point out that he’s not the grammar vigilante he claims (somewhere; I’m not sure where) to be, because grammar’s one thing and punctuation’s another. And that’s a powerful argument for not claiming to be an expert on anything: Sooner or later you’ll get something wrong and someone else will find it. And point a finger at you and feel clever about it. That someone may not be an expert themselves, but it takes a whole lot less expertise to find one mistake than it does never to make any. All this led me to learn that chain stores are dropping their apostrophes all over Britain’s high streets. So far, no pedestrian casualties have been reported. If you’re in the American Midwest, the high street is the equivalent of Main Street. If you’re anywhere in the U.S. except New York, it’s the equivalent of downtown. If you’re in New York, you’ll just have to muddle through without a translation. Waterstones—the bookstore chain that was once the bad guy in literary circles because it was forcing out independent bookstores but has become the good guy because it’s at least a real bookstore, not Amazon or something else on the internet—has dropped its apostrophe because that works better online. Barclays, Marks and Spencer, and a few others have done the same. If you want more examples, the comment on this story has more of them than the story itself, which is pretty minimal. In the U.S., place names are apostropheless because the U.S. Post Office doesn’t believe in them. Harpers Ferry comes to mind. If apostrophes are clothing, Harpers Ferry runs around stark naked. In Britain, the rule on place names seems to be, Do anything you damn well please. Earl’s Court has an apostrophe if it’s the tube station but not if it’s the event venue, which is Earls Court. (Sorry, event venue is a ridiculous phrase but its the description I found and it knocked any real language out of my brain) On the other hand, the Barons Court tube station has no apostrophe. I could go on, but enough. The Bristol vigilante will never be out of work. Unfortunately, it doesn’t pay.